Network with DCEN in 2015! All Metro-Washington Environmental Organizations and Activists are Invited to Our Monthly Networking Opportunity! On January 8th at NOON, join the DC Environmental Network for a perfect way for DC sustainability advocates to start the year. We had an incredible 2014. Now let’s start 2015 with a bang! Come meet Mayor-Elect Bowser’s nominee for Director of the District Department of the Environment (DDOE), DC Councilmember Tommy Wells, as he gives an overview of what DDOE will be focused on with the new administration. This will also be an opportunity for all of us to start sharing what we hope will be in store for the District’s environment in the coming year. We will also be giving out DC Environmental Network Advocacy Award’s to Councilmember Mary Cheh, Councilmember Kenyan McDuffie, Nicole Rentz (Cm. Cheh staffer) and Ronan Gulstone (Cm. McDuffie staffer). Space will be limited. You can only attend if you RSVP here. Councilmember Cheh and her Legislative Director, Nicole Rentz (and others), have worked extremely hard in 2014 to modernize the District’s waste management practices and worked closely with DCEN, Sierra Club, Institute for Local Self Reliance and others to incorporate policy changes that support the international concept of zero-waste. Cheh’s offices have also been leading the charge with legislative initiatives on a number of other issues important to the environmental community. Councilmember McDuffie and his Committee Director, Ronan Gulstone (and others), have been at the forefront of leading efforts to combat global warming in 2014. Committee on Government Operation’s Chairman McDuffie marshaled a number of legislative initiatives through the Council including a bill to expand access of low and middle income District residents to the promise and benefits of solar energy and a bill to help the District meet its renewable energy goals by focusing important incentives on energy sources that have the most promise including wind and solar. Chairman McDuffie also supported a number of other environmental initiatives in 2014. We are making a special point of recognizing the staff that work at the Council because they are often the face and voice we experience on a daily basis as we all engage in education and advocacy on our issues. Let us know you are coming. Space is limited. RSVP here. Come show your appreciation for their work on climate, waste and other issues. DC Council Unanimously Passes Clean Energy Bill! 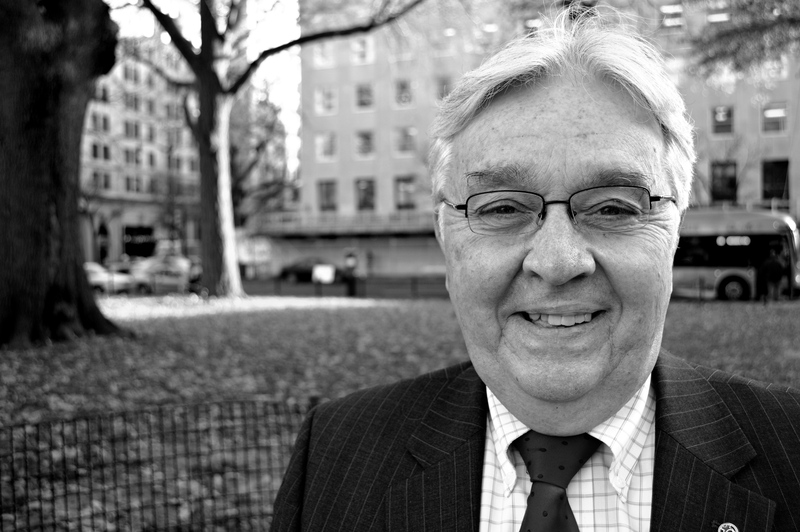 PAUL’S UPDATE: DC Council Approves Bill to Support & Grow Wind & Solar Energy! 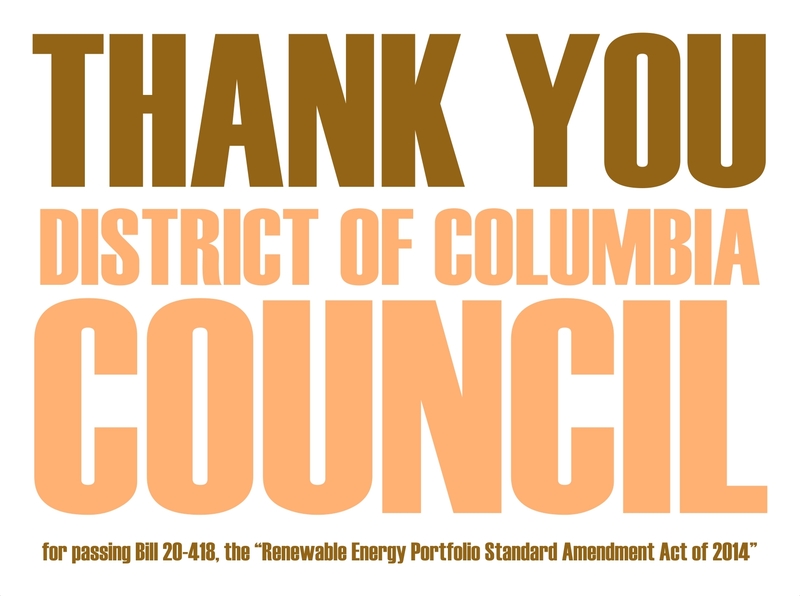 Just minutes ago I watched as the District of Columbia Council unanimously voted to approve Bill 20-418, the “Renewable Energy Portfolio Standard Amendment Act of 2014.” This was the final vote of a 17-month campaign effort. Mayor Gray is expected to sign the bill in the near future. The DC Environmental Network (DCEN) played an important, central role in making this happen. Please take a moment to make a donation and keep us moving towards a clean energy future. This bill makes the District of Columbia a national leader by updating the list of what constitutes a clean source of energy in the District’s Renewable Portfolio Standard (RPS). It does this by eliminating, in the coming years, the current practice of sending District dollars to incentivize the use of dirty and inefficient “black liquor” (a by-product of the paper-making process). It makes these same dollars available to incentivize newer, cleaner forms of energy like wind and solar. Clean energy is what we desperately need to reduce carbon emissions and combat global warming. That’s an important change that we can all be proud of. 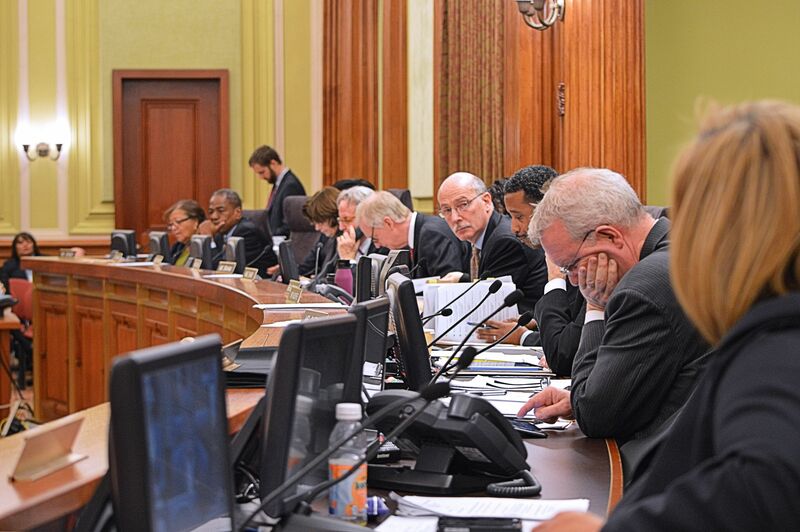 We enthusiastically thank the DC Council for voting to support a future with more solar and wind power. Their actions are helping build the infrastructure to create new industries that can employ District residents with good, meaningful jobs. Since the bill was introduced by DC Council Chairman Phil Mendelson and Councilmember Mary Cheh in July of 2013, the DC Environmental Network has been working hard to make sure the campaign stayed on track to get this bill passed before December 31st, the end of this Council period. After a lot of hard work, including the focus of the Chair, Kenyan McDuffie, of the Committee on Government Operations, we achieved this goal! We thank all of you who helped in this effort. We could not have succeeded without you. And, of course, we could not have accomplished our goals without resources. DC PSC Should Reject Pepco-Exelon Merger! The DC Environmental Network (DCEN) has been busy working to finish a legislative campaign designed to make changes to the District’s Renewable Portfolio Standard (RPS) that will result in increasing opportunities for wind and solar, and decreasing, and ultimately eliminating rate payer dollars that end up supporting dirty and inefficient black liquor and related biomass energy sources. We are also currently gearing up to oppose the Pepco-Exelon merger. 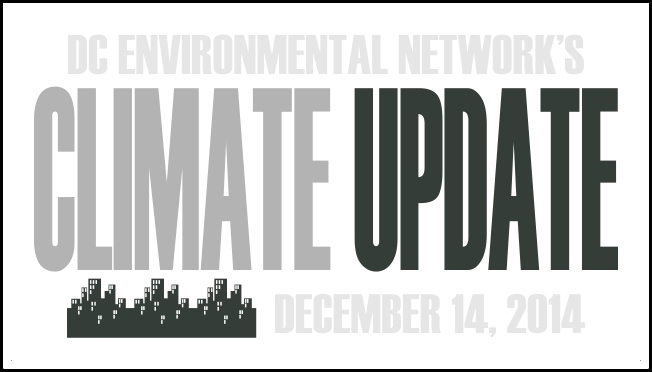 The following are quick updates that will share the latest but also let you know about opportunities to show support for renewable energy. We are in the final week of a campaign that started on July 10, 2013, when DC Council Chairman Phil Mendelson and Councilmember Mary Cheh, introduced Bill 20-0418, the “Renewable Energy Portfolio Standard Amendment Act of 2013″ to eliminate black liquor from the District’s RPS laws and create efficiency standards on the use of the remaining qualifying biomass energy sources. SEE COMMITTEE REPORT HERE! DCEN, CCAN, Sierra Club (DC Chapter), DC Divest and many others have participated in hearings, DC Council meetings, climate rally’s and numerous other educational and advocacy opportunities. In the end we have succeeded in defending the intent of a bill that will help move the District and region forward. This would be a nice way to end the year. 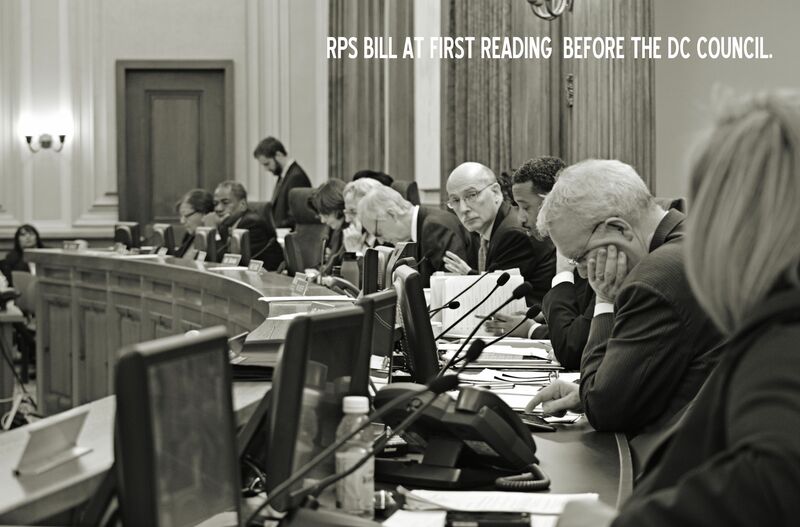 OPPORTUNITY TO SHOW SUPPORT FOR CLEAN ENERGY RPS BILL: This Wednesday, December 17th at 10:00 AM, the DC Council will be holding the last legislative meeting of the year and will include the FINAL reading of the RPS bill we have all worked so hard to pass. DCEN and others will be at the legislative session showing support. If you want to join us send us an email and we will send you more information. – DCEN Opposes Proposed Pepco-Exelon Merger! A growing number of DC activists and organizations are coming to the realization that giving the keys to our clean energy future to Chicago based Exelon would be a major mistake and working to stop the merger could be the most important thing we all do in 2015. DCEN invites all to join DC activists December 17th at 5pm at 1333 H St. NW, Washington, DC for a rally to oppose Exelon’s takeover of Pepco and a holiday party. We’ll be demonstrating our opposition to the Exelon-Pepco merger and celebrating a great year of citizen action in DC. This will also be an opportunity for anyone who wants to testify in opposition to the merger. DCEN believes the proposed Pepco-Exelon merger threatens DC residents and local businesses with higher energy bills and lower reliability. The merger reverses the District’s progress on local renewable energy and energy efficiency, and it moves decision making for the District’s grid from here in DC to a powerful corporation’s headquarters in Chicago. Exelon’s corporate interests are not aligned with the policy objectives of the District of Columbia, and Exelon’s acquisition of Pepco is not in the public interest. 1. The Pepco-Exelon Merger Would Hurt the District’s Poor & Middle Class Residents! Pepco-Exelon merger would mean higher electricity bills. Exelon’s own regulators have told the Public Service Commission (PSC) the merger will result in higher electricity bills. Exelon could not have picked a worse time. 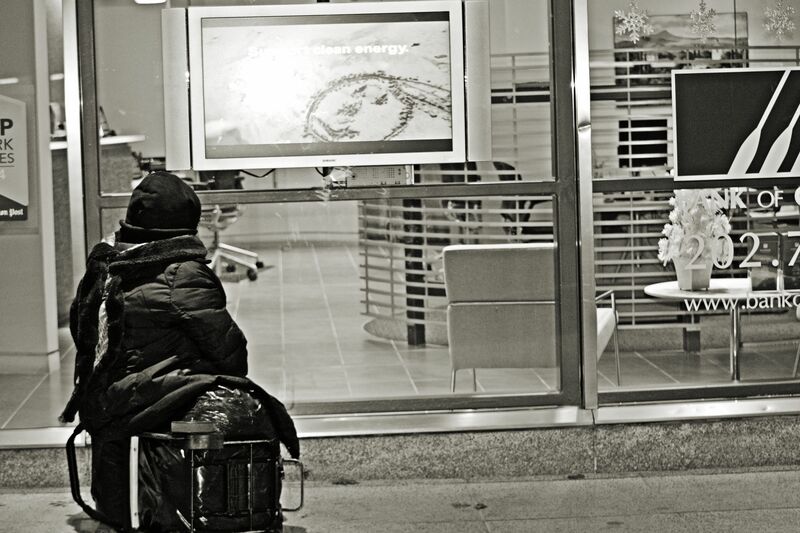 According to a Survey from the U.S. Conference of Mayors, hunger and homelessness has continued to increase in U.S. cities. The District of Columbia led all cities with both the largest increase in the number of requests for emergency food assistance and largest increase in homelessness. Approving the merger would mean increased energy costs for the poor and middle class and would make this bad situation even worse. Our city cannot afford to increase the burden placed on the poorest District residents. 2. The Pepco-Exelon Merger Would Hurt the District’s Progress and Targets for Renewable Energy and Energy Efficiency! Exelon’s track record has made it clear that they do not support the vision of organizations like DC SUN, DCEN and others who want to grow solar (and other renewables) in every neighborhood in the District. Exelon’s track record shows that District residents should expect little or no support for the stated goals of the District’s Sustainable DC plan of increasing use of renewables up to 50% and cutting citywide energy use by 2032. Exelon has fought against renewables and energy efficiency in Massachusetts, New Jersey, Maryland, Illinois and Ohio…we should expect nothing less should a merger be approved by the Public Service Commission. One only has to look at Exelon’s large portfolio of 23 expensive (some aging) nuclear power plants and its business model to expand its ratepayer base to pay for its nuclear portfolio, to understand it does not spend much of each day trying to build a clean energy future. Exelon, through its actions, have shown they want to create a “Nuclear Renaissance” and continue to put our communities at risk. 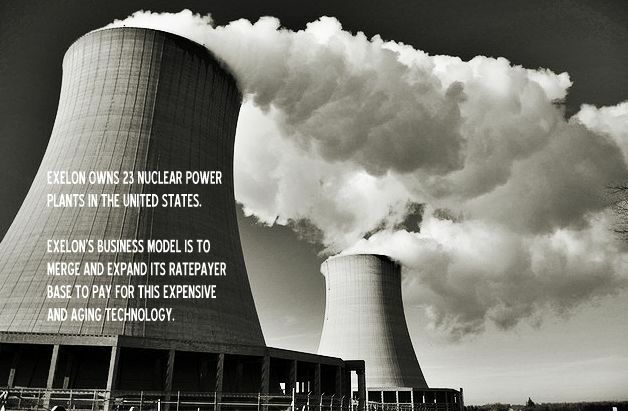 Unlike countries like Germany, who have shut down ALL their nuclear power plants, Exelon chooses to ignore the lessons of Fukushima, Chernobyl and Three Mile Island and continue to anchor their energy portfolio with this archaic and costly energy source. They do this at great financial risk to all of their current and future ratepayers. 3. The Pepco-Exelon Merger Would Dramatically Decrease Local Control of Our Electricity! 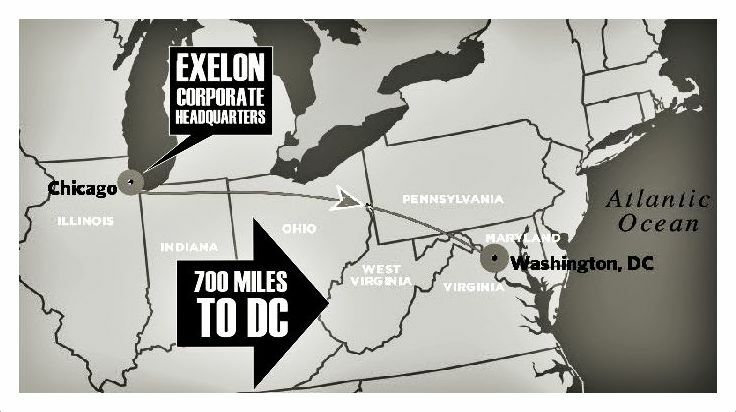 Exelon’s corporate headquarters is about 700 miles away! Pepco’s headquarters are right in the middle of the District. DC has benefited from having key utility decision makers from Pepco living in the same neighborhoods that have been impacted by reliability problems like the Derecho storm. Our Public Service Commission, Mayor, Council, NGO’s and District residents have all benefited from having folks from all levels of Pepco corporate decision making circulating amongst us. Pepco has been far from perfect but at least they are from here. 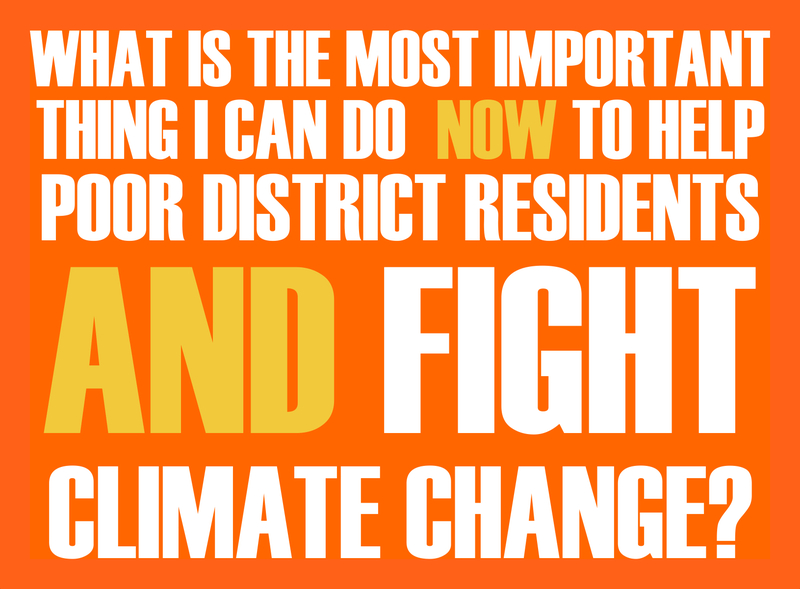 Exelon does not have a stake in District residents, local issues or our priorities. It is extremely likely that much of the decision making about our own energy future will be made in Chicago by folks with little connection with our interests. These are just some of the many problems a Pepco-Exelon merger could bring to the District and surrounding jurisdictions. We will be holding a DCEN brown-bag in January to give organizations an opportunity to join the campaign and help fight what could be the most important issue of the year. Research is great. More so, it is necessary when learning about a new topic. Watching a movie or looking at diagrams is insightful and dynamic. But I believe that nothing quite beats seeing a concept put into action live to get a point across. That’s way I was so excited to—after having researched about E-Recycling legislation and written up my findings in a blog and video combo—to be able to go on some field trips to see computer refurbishing and recycling in action. On October 1, I met with Dennis Courtney, the President of Capital PC User Group’s Project Reboot for a personal tour of his facility. Project Reboot is a volunteer run computer refurbishing nonprofit. They accept donations of laptops, desk tops, printers, copiers, and any computer related equipment (mouse, keyboards, cords, etc.). They do small-scale refurbishing of the laptops and desk tops, mainly replacing the hard drives, while adding memory and a DVD-player. Electronics that cannot be refurbished or used for parts are recycled at Montgomery County Transfer Station; this is also where Project Reboot receives many of their computers. They have an open agreement with Montgomery County to pick through the electronics recycling bin at the transfer station for viable electronics. Once the electronics are ready for use, Project Reboot sells them for low prices to low-income individuals that have referrals stating their need. Computers sell for only $25, which comes with a warranty and after-warranty tech support. 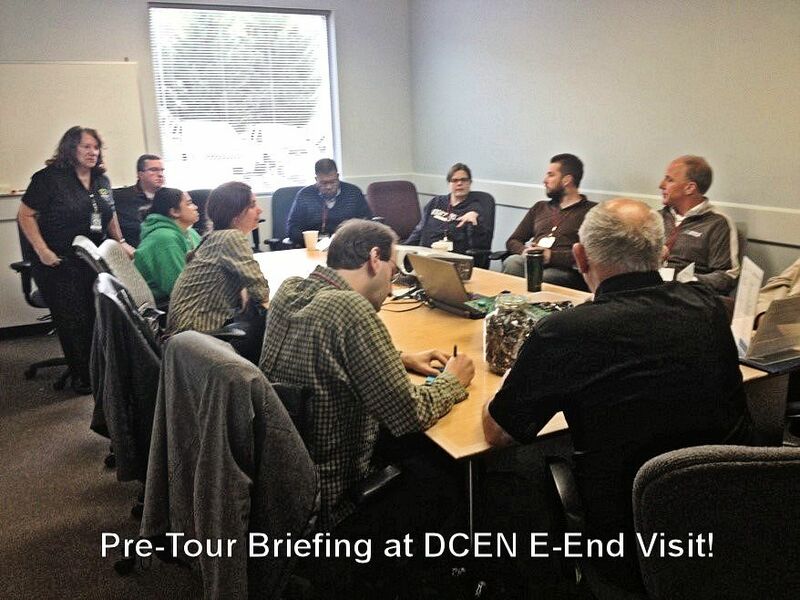 On November 3, a group of ten of us attended a facility tour of E-End in Fredericks, Maryland. We met with the CEO, Arleen Chafitz, and President, Steve Chafitz. 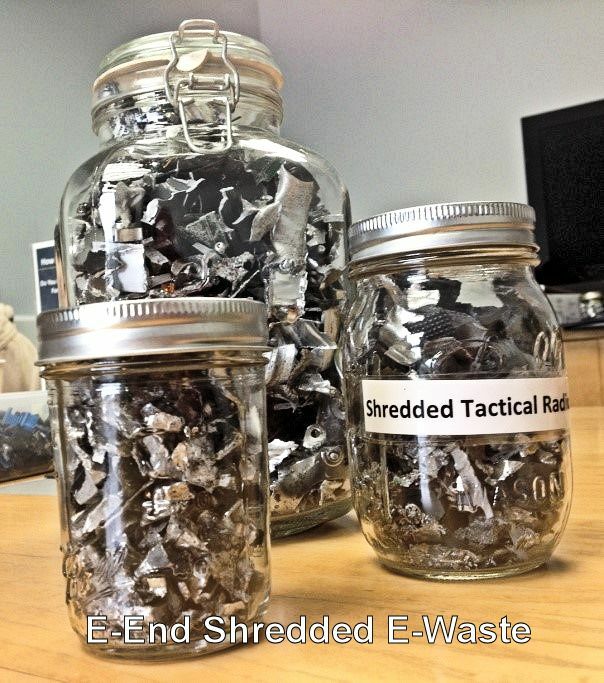 E-End is a small business that specializes in electronics recycling and data destruction. They employ 16 people full time, whose previous work experiences vary, because they can properly train anyone from a High School drop out to a college graduate, as long as they are able to pass a background check and drug screen. E-End also contains a refurbishing component, refurbishing those computers able to be saved, before recycling the ones that cannot. After an educational discussion of the process, costs, and certifications for electronics recycling, we toured the facility and saw how the different components of the electronics were broken down. These two organizations are exactly what the District needs. As stated in the earlier blog, the District just passed a new Solid Waste Bill that will make it illegal to dispose of electronics in the trash by 2018. While it is a good start, DC Environmental Network (DCEN), Institute for Local Self Reliance, and others involved in our E-Recycling campaign are disappointed that the language of the bill omitted incentives for localized recycling. DCEN would like to see that the city adopts a policy that allows approved nonprofits to pick through the collected electronics to be recycled for ones that can be refurbished or used for parts, similar to the symbiotic relationship between Montgomery County and Project Reboot. The remaining electronics would be sent to a recycling company, preferably one set up in the District that is certified with e-Stewards. Using this system, the District would benefit from new jobs, such as those at E-End, new marketable skills, such as the skill volunteers have at Project Reboot, and more affordable computers for low-income residents and students. It’s a win-win-win scenario, without even counting all the wins for the environment and public health. As we move forward in the coming weeks, we will be discussing with potential nonprofits, entrepreneurs, and council members, how to best produce this desired system for the District’s new E-Recycling initiative. If you would like to be involved in the process, please contact me at mhcruickshank@dcen.net .